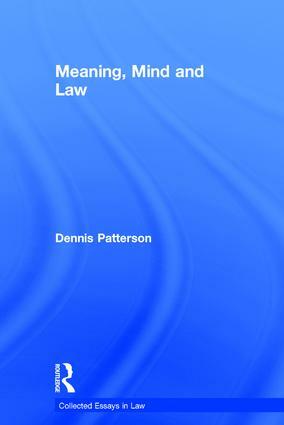 In this important collection of papers, Dennis Patterson continues to show the importance of Wittgenstein's thought for problems in legal theory. Ranging across issues in the philosophy of mind to questions of meaning and normativity, this collection of papers is essential reading for anyone with an interest in legal theory. Contents: Preface; Introduction; Moral evaluation and conceptual analysis in jurisprudential methodology (with John Oberdiek); Dworkin on the semantics of legal and political concepts; Wittgenstein on understanding and interpretation (comments on the work of Thomas Morawetz); Notes on the methodology debate in contemporary jurisprudence: why sociologists might be interested; Interpretation in law; Fashionable nonsense; Normativity and objectivity in law; Explicating the internal point of view; Langdell's legacy; Wittgenstein and constitutional theory; Conscience and the constitution; Law's pragmatism: a theory of law as practice and narrative; Law's practice; Realist semantics and legal theory; Interpretation in law: toward a reconstruction of the current debate; Name index. Dennis Patterson is Professor in the School of Law at Rutgers University, USA, and is Professor of Jurisprudence and International Trade at the School of Law, Swansea University, UK.